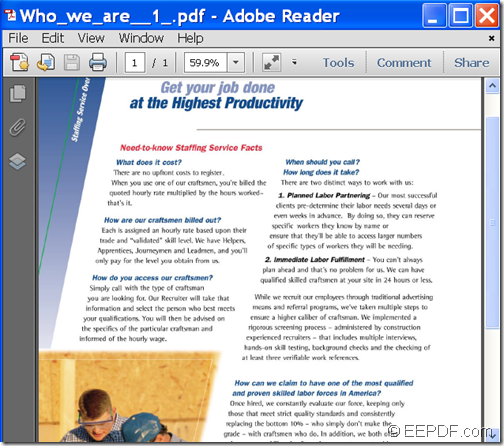 Have some scanned PDF documents and want to copy and paste the text contents from scanned PDF to Word? 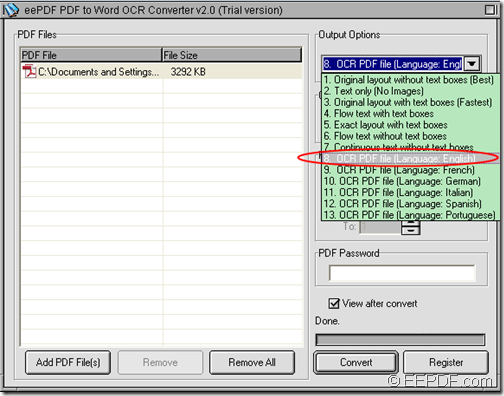 If so, please read on to see how to convert scanned PDF to searchable and editable Word with the application EEPDF PDF to Word OCR Converter. EEPDF PDF to Word OCR Converter is a professional PDF tool that can convert scanned and image PDF files to highly-editable Word documents with OCR technology. And what is OCR? Well, OCR (Optical Character recognition) is used in the mechanical or electronic conversion of scanned images of handwritten, typewritten or printed text into machine-encoded text. Only in 5 simple steps, you will extract texts from scanned PDF document to Word successfully. 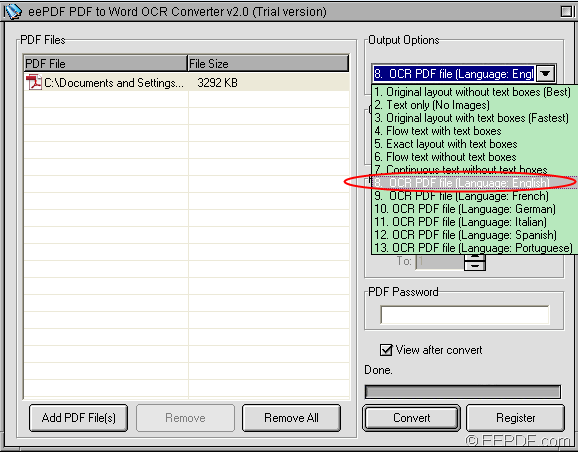 Please download the installation package of EEPDF PDF to Word OCR Converter firstly.. Then, please double-click the downloaded EXE file and follow the installation wizard to install it on the computer. Please open this application and you can see its GUI interface on the screen. To import scanned PDF into the application, you can click the button Add PDF File(s) at bottom of the GUI interface and then choose file in the opened file picker window. To save your time, you can also directly drag and drop the scanned PDF files into the application. This smart tool supports six languages in OCR PDF files including English, French, German, Italian, Spanish and Portuguese. Please choose a suitable OCR option in the drop-down list of “Output Options” according to the language of your scanned PDF documents. Please see it in the following snapshot. 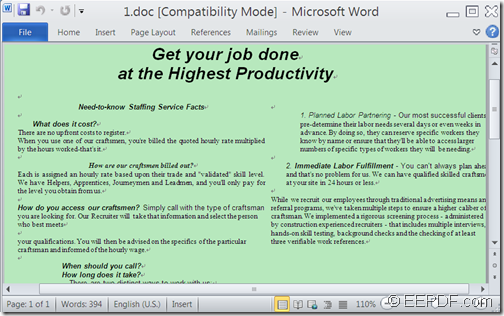 This application supports two output formats: MS Word Document (*.DOC) and Rich Text Format (*.RTF). Please check one of the radio buttons in the “Output Format” group box. To start the conversion, please click the Convert button at bottom of the GUI interface, and then specify a name and an output folder for the converted Word file in the “Save As” dialog box. At last, please click the Save button in the “Save As” dialog box to extract texts from scanned PDF document to Word file. In a few minutes, you can get the output Word document in the output folder and then you can edit, copy and paste scanned PDF contents freely on Microsoft Word processor. Looks great, right? 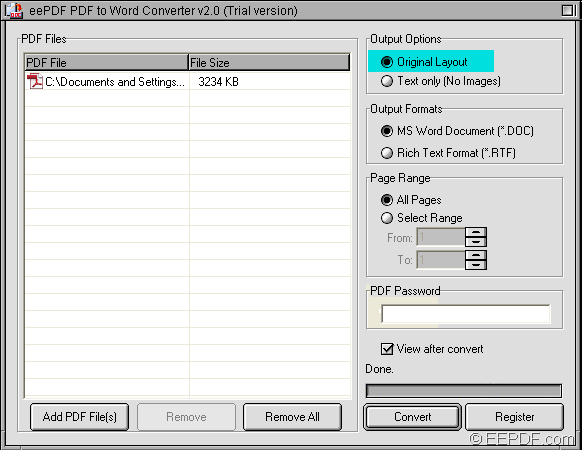 Just get EEPDF PDF to Word OCR Converter yourself and have a try. Do you want to find a quick way to copy contents from PDF to Word and keep original elements? Instead of copying it little by little, EEPDF PDF to Word Converter can help you quickly copy PDF contents to Word and retain the original layout and other elements with ease. EEPDF PDF to Word Converter is a simple and professional tool for converting PDF files to editable Word documents in DOC and RTF formats. What’s more, it can keep elements including text, fonts, multicolumn, tables, graphics, and images the same with the original PDF files. In the following contents, you will see how to use this tool to convert PDF contents to editable Word with original layout. 1. 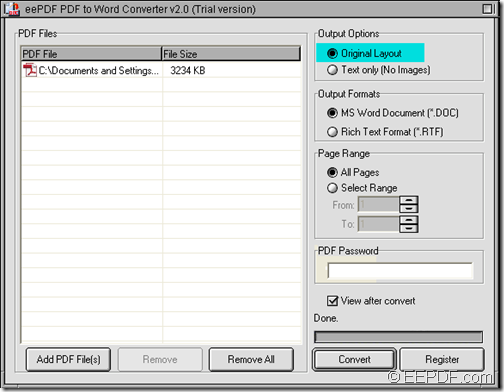 First, please free download EEPDF PDF to Word Converter. Then, please double click the downloaded installer and follow the setup wizard to install it on the computer. 2. After the installation, you can find a shortcut icon of this application on the desktop. Please double click this shortcut icon to run this application. When its user interface appears on the screen, please add PDF files into the file list of this application by clicking the Add PDF File(s) button in the bottom toolbar of the user interface to open file picker window in which you can choose files. You can also add the PDF files using drag and drop operations. 3. To keep the original elements of the PDF documents in the converted Word file, please check the radio button of “Original Layout” in the “Output Options”group box on the top right panel of the user interface. Please see it in the following snapshot. 4. In the “Output Format” group box below the “Output Options” group box, please check the radio button of “MS Word Document (*.DOC)” or the radio box of “Rich Text Format (*.RTF)” to specify an output format. 5. Please click the Convert button in the bottom toolbar of the user interface to start to convert the PDF document to Word file. When the “Save As” dialog box appears, please specify a name and choose a destination folder for the converted Word files. Several seconds later, you can get the editable Word in the specified location. The following two snapshots are from the original PDF document and the converted Word document. This is the end of this article and you can get EEPDF PDF to Word Converter here. If you want to convert PDF to PowerPoint presentation and preserve the original layout, the application EEPDF PDF to PowerPoint Converter will be a good choice for you. 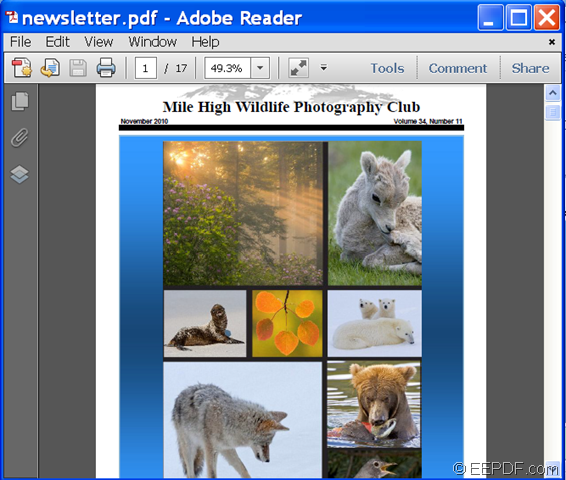 Converting a PDF to PowerPoint is a great way to make a presentation out of the content of a PDF. 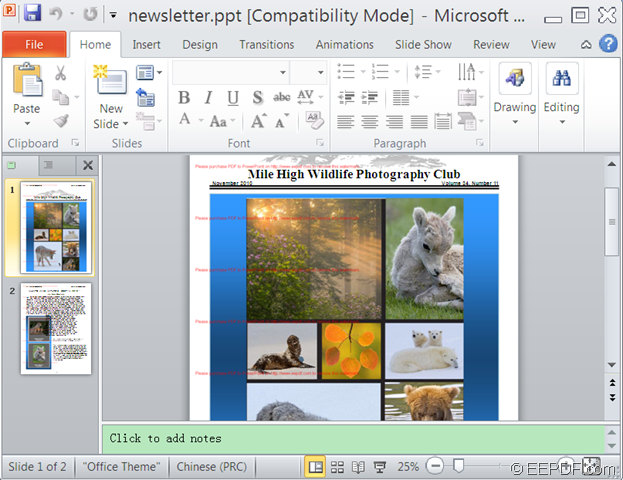 Once in PowerPoint, you will be able to add slide transitions, additional text, music and more. EEPDF PDF to PowerPoint Converter is a professional application that can convert PDF to PPT and preserve the original text, images, graphics, tables, hyperlinks, layout, etc. Just by following the instructions below, you can quickly convert your PDF files to PowerPoint presentations in seconds. 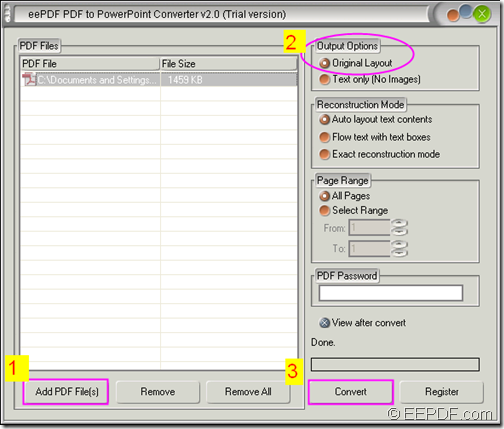 Please download the installer of EEPDF PDF to PowerPoint Converter. After the download, please double click the installer and follow the installation wizard to install it on the computer. During the installation, please create a shortcut icon on the desktop for use convenience. After the installation, you can double click the shortcut icon on the desktop to launch this application and then you can see its user interface on the screen. To add PDF into the application, you can click the Add PDF File(s) button at bottom of the user interface to open the file picker window in which you can choose PDF files. Or you can also directly drag and drop the PDF files into the application. To delete the added file, you can click the Remove button to delete the selected files or click the Remove All button to clear all the PDF files in the processing file list. On the top right panel of the user interface, please check the radio button of “Original Layout”to preserve the original layout of the PDF in the converted PowerPoint presentation. After the settings, please click the Convert button in the bottom toolbar to convert the PDF document to PowerPoint PPT slides. In the popup “Save As” window, please specify a name and destination folder to save the converted PPT file. The following snapshot shows the whole process. Note: The trial version only supports to convert the first two pages of PDF to PPT and leave watermarks on the converted PPT files. To eliminate these limitations, please buy the full version of EEPDF PDF to PowerPoint Converter. With the help of EEPDF PDF to Image Converter Command Line, you can convert PDF to image and rotate image. PDF (Portable Document Format) is great for exchanging documents, but sometimes it may annoy and even deter your viewers when your computer or portable devices do not have a PDF viewer installed. In order to make PDF material more accessible to others, converting PDF material to images may be an alternative to consider. EEPDF PDF to Image Converter Command Line is a professional command line application that can help you convert your PDFs to images in the format of JPG, PNG, BMP, GIF, TIF,EMF, PCX, TGA. etc. What’s more, it allows you to rotate the converted image in a specific angle. 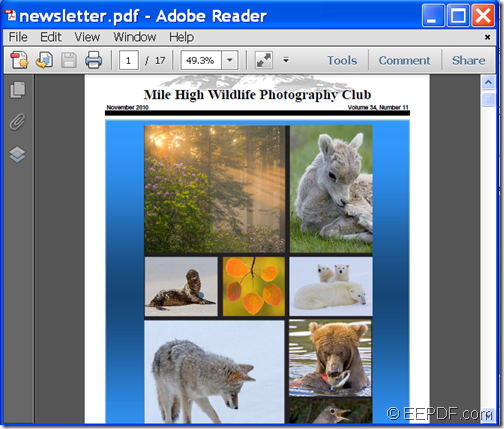 The following contents will show you how to use this application to convert a PDF document to rotated image. At first, please download the package of EEPDF PDF to Image Converter Command Line. The downloaded file is a ZIP file and you just need to unzip it to a folder on your computer disk as normal. In the unzipped folder, there is an executable file named pdf2img.exe which is the called program for the following conversion. In order to use this application, please open the MS-DOS command prompt window in which you can input commands. pdf2img: please input the complete path of the called program—pdf2img.exe. [options]: please input the corresponding parameters you want to make. For details of these parameters, you can read the readme.txt document in the unzipped folder or input the path of the called program—pdf2img.exe and then hit Enter button in the MS-DOS command prompt window. 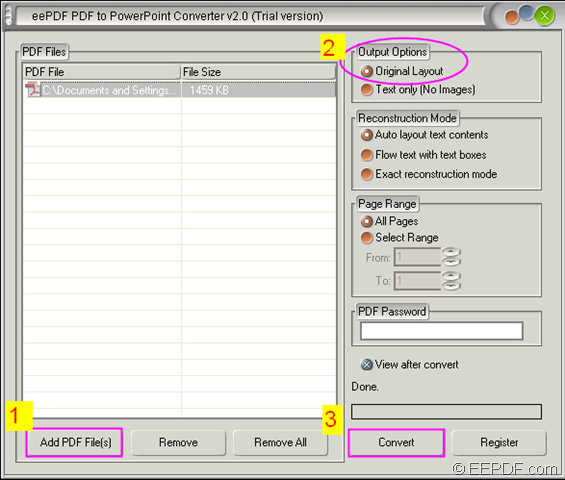 <PDF-file>:please input the path of the PDF file you want to convert. <img-file >: please input a path where you’d like to save the created image. According to the usage of the application, if you want to rotate the converted image, please use the parameter: -rotate <int>which is used to rotate output image file at special angle. This example is to convert a PDF document named Australian.pdf to Australian.jpg image and rotate the JPG image in the angle of 90. This is the end of this article and you can get full version of EEPDF PDF to Image Converter Command Line here. 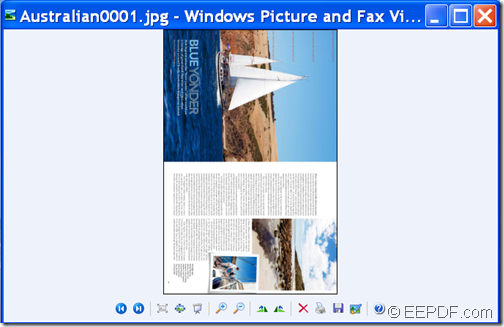 Do you want to convert PDF to image (JPG, PNG, BMP, GIF, etc.) and trim image properly? If so, EEPDF PDF to Image Converter Command Line will be a good assistant for you. Although PDF (Portable Document Format) is widely used to share, exchange documents, you may need to convert your PDF format to common image formats where you don’t have a PDF viewer installed on your portable devices. EEPDF PDF to Image Converter Command Line is a powerful yet smart application. It can convert PDF to JPG, BMP, PNG, GIF, TIFF, TGA, etc. image. It can also trim the created image to a specific size and set image quality, image resolution, page size, compression mode, etc. for the converted image. Just by following the steps below, you can successfully convert PDF document to trimmed image. Please download EEPDF PDF to Image Converter Command Line and unzip it to a folder on your computer disk. After that, you will be able to find an executable file named pdf2img.exe and you need to call it in the MS-DOS command prompt window to realize the conversion. pdf2img refers to the path of the called program pdf2img.exe, which is used to call the program. [options] refers to the parameters provides by the program, which is used to control the conversion or make settings for the converted image. To know these parameters, you can read the readme.txt document which describes them in detail. <PDF-file> refers to the path of the input PDF file. <img-file> refers to the path of the output image file. If you need to trim the converted image, you can use the parameter “-trimimage”. The example is to convert a PDF document named application.pdf to application.jpg image and trim the JPG image. When you finish the commands, please do not to hit the Enter button on the keyboard to run your commands. Kind remember: For trial version, there will be some watermarks on the surface of the converted image. To eliminate this limitation, please buy the full version of EEPDF PDF to Image Converter Command Line.